Organized by Colonel August Willich, a former Prussian army officer who led troops during the German Revolution of 1848, Indiana’s German 32nd Indiana regiment fought in the Western Theater of the Civil War. The 32nd Indiana forged an enviable combat record on the battlefields at Rowlett’s Station in Kentucky; at Shiloh, Stones River, and Missionary Ridge in Tennessee; and at Chickamauga and Pickett’s Mill in Georgia. The letters collected here originally appeared in German in wartime issues of German American newspapers. These rare documents connect the contemporary reader to the world of the patriotic immigrant soldier and his hard-fighting regiment, revealing personal motivations, wartime experiences, opinions, ethnic pride, and bravery, as this regiment engaged in some of the most bitter fighting in the West. These gripping letters also provide insight into the social, political, and cultural dimensions of the war and reveal the competing ethnic identities, nativism, and immigrant acculturation of late-nineteenth-century America. The Germans of the 32nd Indiana proved themselves to be “Gallant Dutchmen” in the fight to save the Union. 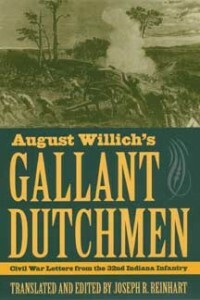 Gallant Dutchmen is a valuable addition to Civil War studies and will also be welcomed by those interested in ethnic and immigration studies. Joseph R. Reinhart is an independent scholar who has specialized in Civil War research. His recent publications include Two Germans in the Civil War: The Diary of John Daeuble and the Letters of Gottfried Rentschler, Sixth Kentucky Volunteer Infantry, and A History of the 6th Kentucky Volunteer Infantry U.S.: The Boys Who Feared No Noise.